In all the work I have done with countless educators from across the world I believe we can break them down into two groups. Good Teachers and Great Teachers. What separates the two is effectiveness. 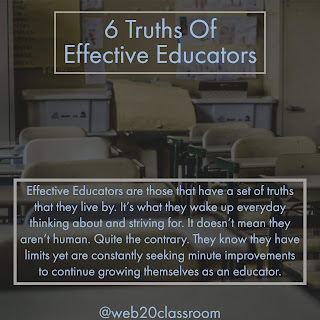 Effective Educators are those that have a set of truths that they live by. It's what they wake up everyday thinking about and striving for. It doesn't mean they aren't human. Quite the contrary. 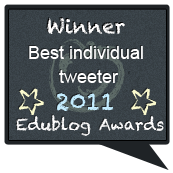 They know they have limits yet are constantly seeking minute improvements to continue growing themselves as an educator. View Their Teaching As A Science And An Art-Most educators, early on in their career, have had one of those moments, at the end of a long successful day, realizing that they learned more in those 8 hours than in their previous 4 years of higher education. It's why doctor's offices are called practices and why we should reframe our notion of teaching as a practice, rather than a set of skills acquired through college courses. 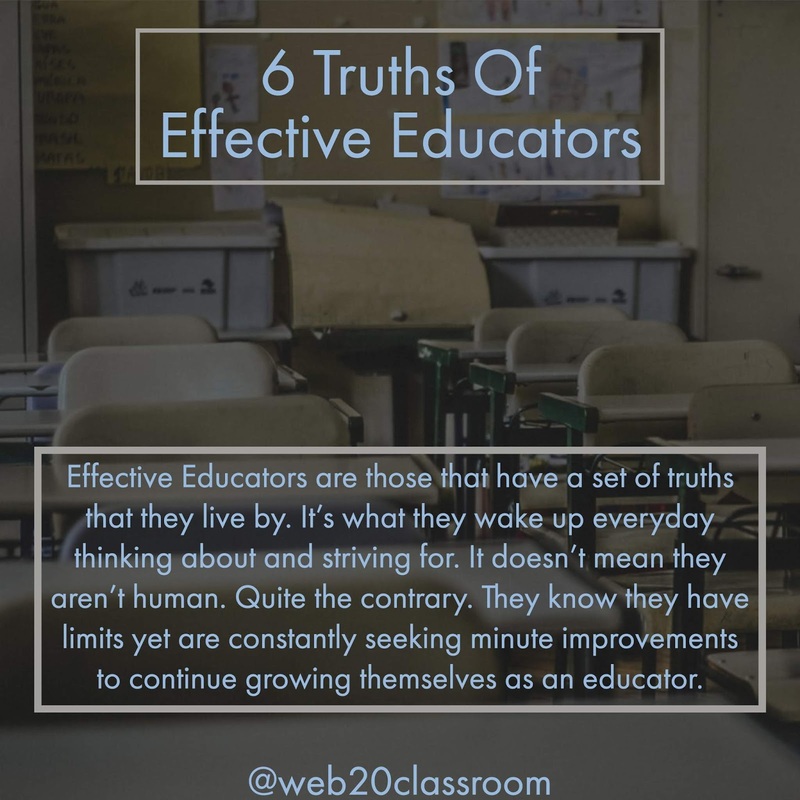 Effective Educators are never satisfied with where they are in their practice and are constantly seeking to figure out the best ways to teach and the best ways students learn. They might experiment with various, evidence-based instructional practices. Perhaps the ones that work are the ones that work for everyone. Or maybe they aren't. The key is they know as time goes by and methodologies change, they are not inflexible. Rather they know there is still much to learn and that each day is an opportunity to practice, fail, examine, reflect and try again. Are Students of their Students-Most educators can attest that if they know who their students are, how they learn and how they think, they can better differentiate for those student's needs. While formative assessment is a key part of knowing who their students are, Effective Educators go deeper. They know their students on a personal level. They know what motivates their them. And, perhaps most importantly, they understand how each individual student learns and thinks. Effective Educators are constantly using questioning of their students. Not to see what the student knows but how they know what they know. What processes are their students using to develop their understanding and how can that be used going forward. Challenge All Students-Current Brain Research shows that intelligence is variable, the brain is malleable and hungers for challenge. Evidence shows that students, even those that may be struggling, rise to the occasion when challenged. We see it in our own lives. When everything we do is easy we become bored and might even become disengaged. When everything is too hard we are resolved to the fact that we can't do it so why even try. In order to avoid being either too easy or too hard, Effective Educators, understanding who their students are, provide differentiated instruction that challenges and pushes their students to go further with their learning. Believe In The Success Of All Students, No Matter What-Research shows that educators and schools that have collective teacher efficacy can grow their students at a tremendous rate. Collective Teacher Efficacy (CTE) is the belief that all students can achieve and those educators will stop at nothing to ensure they do. In order for CTE to be as effective as it can be there has to be buy-in from all educators. As Education Researcher John Hattie notes, "A school staff that believes it can collectively accomplish great things is vital for the health of a school and if they believe they can make a positive difference then they very likely will." Effective Educators believe in CTE. The do all they can to effect the culture of their school to help other teachers buy in to the idea of CTE and provide support. Effective Educators and CTE doesn't stop at the classroom with teachers. It's a collective effort of teachers, administrators, support staff and instructional staff all believing that the positive things they can do for their students will ultimately make a difference. 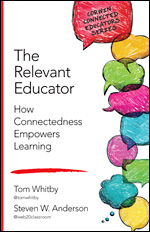 Continuously Seeking Out Professional Learning-Effective Educators don't just believe that lifelong learning is a characteristic they want their students to have, it's a mantra they live by. They aren't waiting for their principal or school or district to tell them what they need to learn. They are continuously seeking out professional learning. to improve all aspects of their practice. 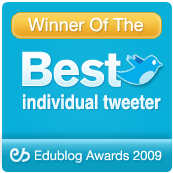 Whether it is a national conference in their subject area, an online course in evidence-based instructional practices, a Twitter chat to push back against conventional thinking or a webinar to learn about a specific type of EdTech, they are hungry to learn and know their learning never stops. Even reading blog posts, articles in trade publications, books, or attending Edcamps, they want to constantly be examining their own practices, realizing opportunities for improvement and capitalizing on all that learning. Feedback Is A Part Of Their Routine-Effective Educators don't just look at their classroom as a unique, fluid space that they are constantly evaluating and improving. They also look inward at their own practices, thinking about where they are in their teaching and where they want to improve. Effective Educators seek out feedback from their colleagues. They invite them in to evaluate their teaching and are eager to hear where they can improve. They also participate in the feedback loop with those colleagues. Research shows that educators who engage in honest, open conversation with their colleagues improve their effectiveness with their students. Effective Educators view these conversations as a necessary and critical part of their overall growth.